I like white bar tape and think it often looks great on C&V bikes. I like the white Fizik tape, but the "cork" gets dirty easily and is hard to clean. Your thoughts on tape and cleaning methods? BTW is there any product you can spray on white tape to give it a surface that is easier to clean? I like shellac, but from what I've seen, it tends to yellow the white. I like the Fizik microtech white perforated tape. I use 'dirtiness' as a wear indicator: if it gets too dirty, time for fresh tape. With the wrong shellac, it can. It also tends to yellow with age. Lasts a lot longer than without though. There's always the cheap, padded vinyl stuff. It can be cleaned, it has a useful life about 3 times as long as cork, but costs several dollars less. I've seen this stuff on stock Cioccs that doesn't seem to get dirty no matter what- it's white, and I wish I could find some now. 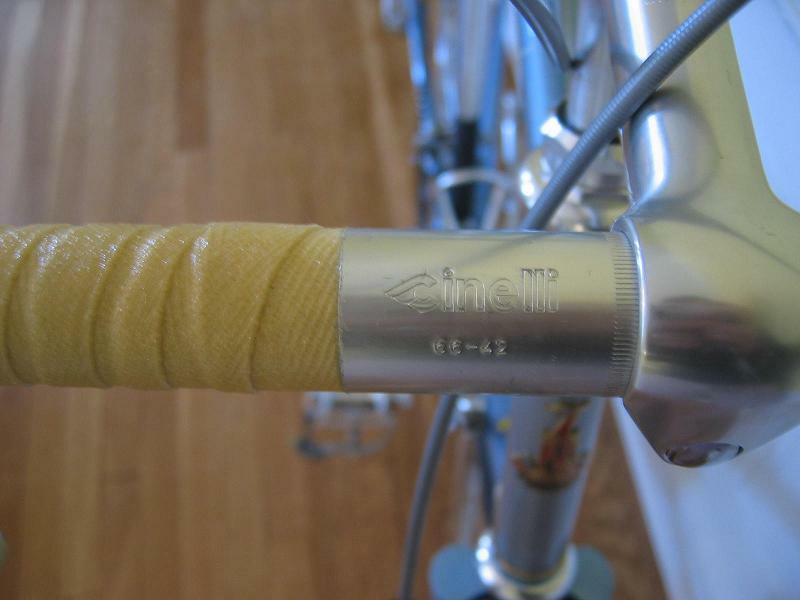 It's plasticky, but its not benotto style tape. Try Mr. Clean's Magic Eraser. I believe you will be very pleased with the results. Best of luck. That could be padded plastic tape, currently made by Bike Ribbon, called "Professional" or just "padded". Some US distributors carry at least a few colors of the stuff. Doesn't get dirty, but isn't as soft as cork tape or some of the spongy new tech stuff. I'm gonna have to get some of that. 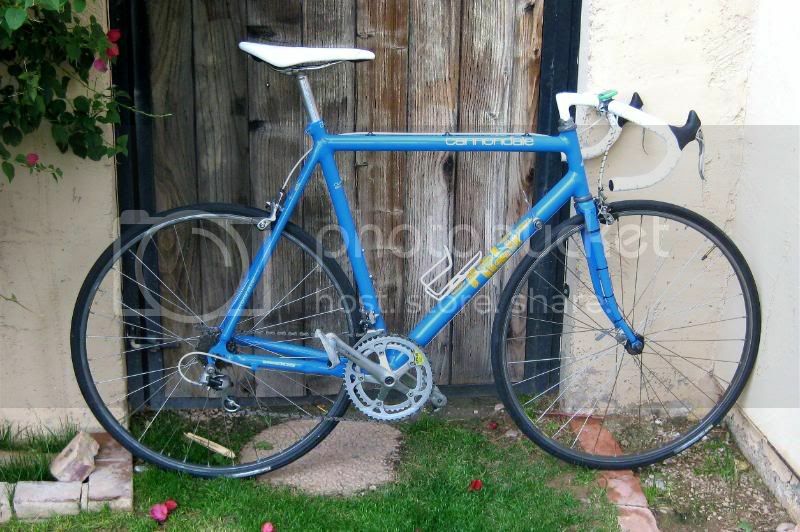 I usually just use Benotto. At the end of the day, the padding doesn't do enough for me to be worth the filth that accumulates on it- if that much of my weight is on the bars, my bike is usually set up wrong for my riding stlyle. 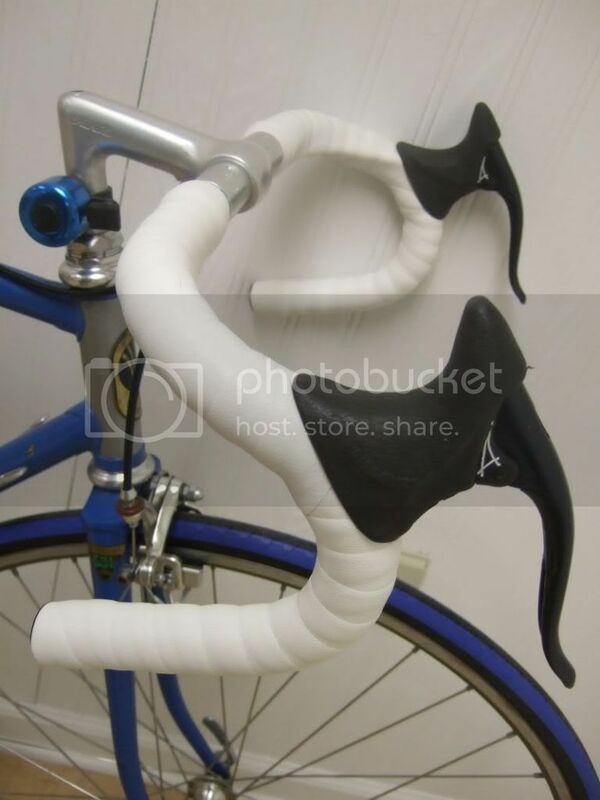 I have some of that white padded vinyl tape that I picked up from bikes I've flipped. I re-use it because it's the only white tape that stays white for me. i sure would like to find a new source. I'll have to search for Bike Ribbon and see what comes up. I tried white cork from performance. They should re-label it "Magic Tape, turns Gray after one or two uses. Passing on some wisdom I picked up here, you can use hockey tape. $4 for a looooong roll, and when it gets dirty you can just tape over it. When it gets too thick strip a layer before retaping. The ragged surface catches all kinds of crap, too. fizik tape + a little dish soap and water + clean rag. rinse thoroughly so the tape does not become sticky with soap residue. I use the Hunt Wilde stuff, as that is what rings a bell with me, and it's bright white to start off, but then gets a yellow tinge after a few weeks. I use cleaner on it, and it's ok, I guess. I wear gloves 75% of the time, at least. What does shellac do to the texture? Stiffs it up. I don't know if you'd be able to bend it around sharp corners without it cracking. It's sorta like really really course sandpaper - it catches dirt and stuff. Feels great when you are riding, but it's not all smooth unless you coat it a zillion times, and then you have to chisel it off if you decide to swap out the bell. Maybe I should try putting six or seven coats on some strips, then wrap with that. I don't think it would crack, but there'd be an edge to catch gunk at ever wrap seam. I shellac the tape after it has been wrapped so cracking has never been an issue. When you want to remove it you can use denaturized (sp?) alcohol to disolve the shellac. The cheap Zinser stuff will turn white bar tap into a gold/yellow color but I know there is a way to avoid that. Look up the forum member "Hydrated", he did a orange and white wrap on his Trek and the white tape looks nice and bright. I think the process is called dewaxing, you might try to google search that. As far as texture, I don't think it's bad at all. I use three coats because I don't like it to look glossy, the texture of the cotton becomes a little pronounced but still fairly smooth. It takes the little amount of padding out of the cotton but I always ride with gloves anyway. It's easy to clean, I use a wet rag every once in a while. The dirty white brake hoods are usually the sign that it's due to be cleaned. I think you're just supposed to have the team wrench put new wrap on nightly - isn't that how Eddy did it? Here is a close up picture of the texture for Tom. I would say it feels somewhere between smooth and skateboard grip tape. Ok here,s my 2 cents worth, on my white cork I use "pure acetone" just wipe the grime away ! BTW, it works brilliantly on white brake hood s also ! For those of you, like me, who have a certain fondness for neon colored padded bar tape, be warned that acetone can remove said neonness, leading to plain, boring, non-neon bar tape.